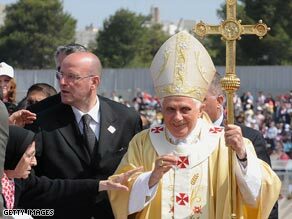 AMMAN, Jordan (CNN) -- Pope Benedict XVI urged greater respect for women Sunday at a historic Mass in the Middle East. A nun reaches out to touch Pope Benedict XVI during Mass in Jordan on Sunday. "Sadly, this God-given role of the dignity of women has not always been understood and esteemed," the pontiff said on his first visit to Jordan as pope. "By its public witness of respect for women ... the Church in the Holy Land can make an important contribution to the advancement of a culture of true humanity and the building of the civilization of love," the pontiff said. He also called on the faithful to oppose terrorism through their good example. Living a good Christian life "means bearing witness to the love which inspires us to lay own our lives in the service of others, and thus to counter ways of thinking which justify taking innocent lives," he said. The pontiff called on Christians in the Middle East to persevere, an acknowledgment that the Christian population has declined sharply in the past 50 years in the region where the religion was born. "May the courage of Christ our shepherd inspire and sustain you daily ... to maintain the church's presence in the changing social fabric of these ancient lands," he said. The pontiff addressed young people in particular, telling them: "Jesus needs you." He encouraged dialogue among Christians of different denominations and people of other faiths and cultures. The 13-minute address at Amman International Stadium comes days after the pope arrived in the country as part of his weeklong visit to the Mideast to promote a good relationship between Muslims and Christians. It is the first papal visit to some of Christianity's most holy places since Pope John Paul II made the pilgrimage in 2000. On Monday, the pope will fly to Tel Aviv to begin his visit to Israel and the Palestinian territories. He is scheduled to pay courtesy visits to Jerusalem's Muslim grand mufti and two chief rabbis.